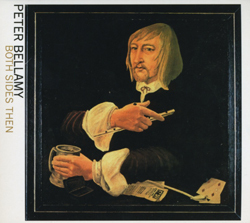 Peter Bellamy was one of the English folk revival’s greatest voices. He became well known as a member of the powerful acappella group, The Young Tradition, in the 1960s. After their break-up, he focused on a solo career establishing himself as one of the most forthright and impressive of younger singers of English folk song. Peter Bellamy’s passions – from the great English traditional singers to the prisoners of Parchman Farm, the mountain music of the Appalachians, the Rolling Stones and especially the poems of Rudyard Kipling, were too wide-ranging to be tied to any one sort of music. BOTH SIDES THEN – originally released in 1979 and generally considered to be his finest solo album – is a superb integration of his varied musical interests, drawing on English, Irish and Appalachian traditions. Working with close friends from The Young Tradition, The Watersons, Louis Killen and Dave Swarbrick, he explores the richness of traditional music. Peter Bellamy, who sadly died in 1991, left a remarkable body of recording which continues to inspire musicians around the world.